Arashi No Ie (‘Stormy House’ in English) explores the ghost world of Wuthering Heights from the perspective of traditional Japanese ghost tales known as Kaidan. The uncanny elements of the novel are considered in an extended comparison with these ancient stories that were translated into English around 1900 by the Greco-Irish author Patrick Lafcadio Hearn. 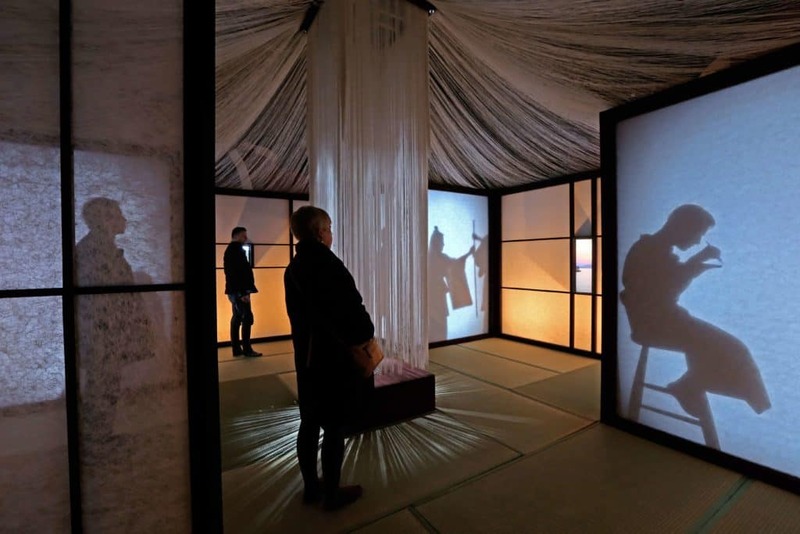 The first exhibition of the Arashi No Ie/Stormy House installation was presented by the Brontë Parsonage Museum in the Brontë’s original home-town of Haworth, West Yorkshire in 2018. Entering a space inspired by a Japanese tea house, visitors stand between two writing rooms and two writers. 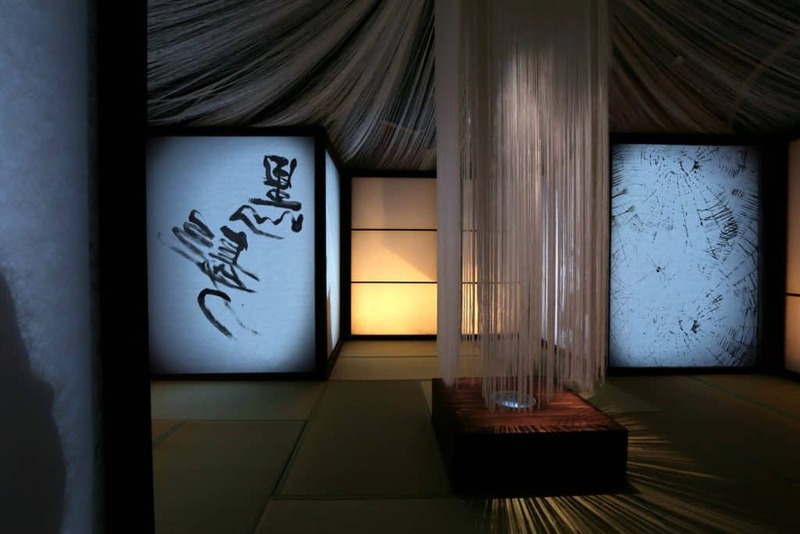 Their texts and drawings are the source of an immersive audio-visual experience, as audience members listen to a series of stories and dialogues and watch multiple projections across a total of 10 surfaces including 6 projected ‘walls’, a concealed projection into a Japanese tea bowl in the centre, a hanging hair-like central thread sculpture and two literal and virtual ‘windows’ onto the landscapes of Japan and Yorkshire. An unfinished ghost story – In a Cup of Tea – inspired the team to use original text fragments and at the centre of the tea house is a teacup with magic properties, like the Mirror of Many Souls (Ungaikyo) in a Shinto shrine, where worlds collide and both Lockwood and Lafcadio Hearn discover ‘the probable consequences of swallowing a soul’. 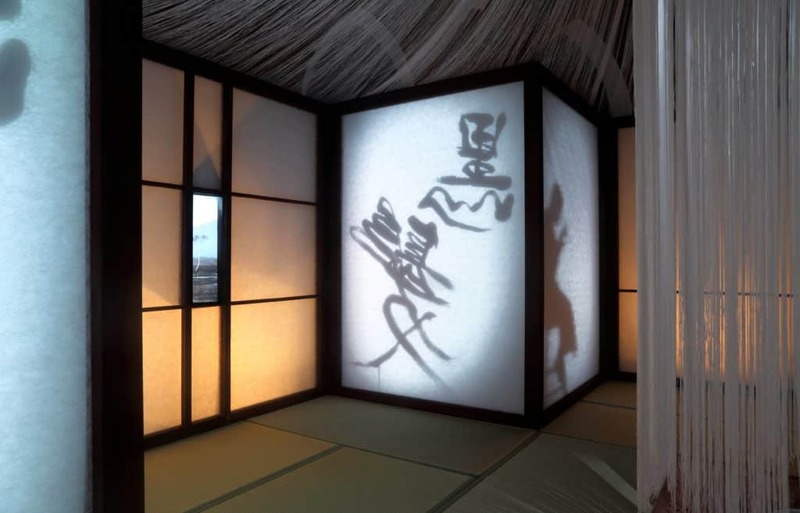 In creating this cross-cultural world, 59’s architectural and video design teams introduced Lafcadio Hearn’s texts in celebration of Japan to a wider audience and integrated two cultures a whole world apart by exploring their common roots in Shinto, Celtic and all mythologies.